Originating from New Delhi, India, Seema worked in Spain for 17 years as a retail store manager before moving to the United States in 1996. Upon arriving her, Seema joined Bank of America (Fleet Bank) as a customer service rep in the individual banking department. She steadily moved up to the position of Assistant Vice President as a Premier Client Manager with hard work and ability to adapt and enhance her knowledge and expertise in the finance industry. Seema won various prestigious awards year after year in the Million Dollar Club. She then joined Wachovia Bank as a Platform banker, helping individual and commercial customers with their banking, lending and investment needs. Moving up to a VP position she attained various awards and certificates for her superior performance in financial sales. Her next post was Sr. VP with Amogh Associates LLC., as a partner to Col. Virendra Tavathia. Seema continued to guide and advise people in Individual and Commercial financial and insurance fields. Excelling in various financial planning stages of their lives, be it college, retirement or estate planning. 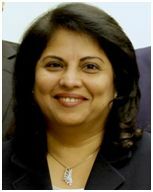 In June of 2013, Seema stepped up as a President of Amogh Agency, acquiring Farmers Insurance Retail Agency, a very successful insurance company from the west coast expanding now to the Northeast. Seema continues to do what she is best at: providing financial and insurance solutions in a very creative and cost efficient manner. She was recently awarded with the prestigious Blue Vase award consecutively for the two years with Farmers Insurance Company given to top performers. Seema is the cofounder of Shradhaa Foundation, dedicated to the children and widows of soldiers of third world countries. Seema organizes various community events in support of various causes recently for Nepal where they collected over $53,000 in donations. You can help honor Seema by coming to our Awards Reception on June 9th at the Pines Manor. Tickets, program ads and sponsorships are available online or by calling Tricia at (732) 738-9482.